Despite an extended hiatus, Romantic Textualities is back, and much has been happening behind the scenes over the past three years. Although we have continued to publish new material since the last issue in the form of book reviews and blog posts, we’re delighted that the journal is now back with our longest and most comprehensive issue to date. To meet our ambitions for the journal, we are in the process of refreshing our editorial team: in the first instance, this has involved the appointment of Maximiliaan van Woudenberg (Sheridan Institute of Technology) as co-editor of Romantic Textualities, who joins Founding Editor, Anthony Mandal, and Associate Editor, Nicola Lloyd, in moving the journal forward in new directions over the coming years. Maximiliaan has been a regular contributor to the journal over the years, writing a number of articles and reviews, and more recently a series of blog posts on transatlantic gothic fiction. As one door opens, another closes: following five years of diligent work, our Reviews Editor, Katie Garner, will be stepping down from her role as of this issue. The editors would like to thank Katie for her commitment in meeting the often demanding logistics of arranging book reviews from our international cohort of scholars. 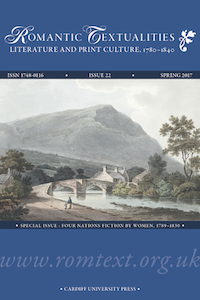 Firstly, we are pleased to publish a special issue on ‘Four Nations Fiction by Women, 1789–1830’, by guest editor Elizabeth Edwards. The focus of Liz’s research is on literary recoveries, textual editing, archipelagic critical approaches, and the history of women’s writing. Her books include a critical anthology of Anglophone Welsh verse entitled English-Language Poetry from Wales 1789–1806 (University of Wales Press, 2013) and Richard Llwyd: Beaumaris Bay and Other Poems, published in 2016 by Trent Editions in their Poetry Recoveries series. The current issue draws on selected articles from the conference on Four Nations Fictions by Women convened by Liz in 2013 at the National Library of Wales. For fuller details, see her introduction to this special issue. In addition, the essays are supplemented by a report by David Buchanan on the Popular Romanticism online archive, an open access resource of 800 print artefacts for the study of print and reading in the Romantic period that explores what and how people read, and how this material changed over time. Finally, Issue 22 carries eleven book reviews on a range of subjects, from Erasmus Darwin to Sara Coleridge and from the historical novel to Napoleonic theatre. Secondly, Romantic Textualities is celebrating its twentieth anniversary, which is marked by its relaunch with a new web interface that brings it up to date. Launched during the infancy of the World Wide Web in 1997, Romantic Textualities began as Cardiff Corvey: Reading the Romantic Text. At a time when blogging was still an incipient, esoteric practice, and initially envisaged less a journal than an online newsletter, Cardiff Corvey provided regular updates to scholars about the collaborative bibliographical work that was taking place between the newly founded Centre for Editorial and Intertextual Research, Cardiff University and Projekt Corvey at the University of Paderborn. Our activities at the time emerged from the work of Professor Peter Garside and the late, and much missed, Prof. Rainer Schöwerling in preparing the second volume of The English Novel, 1770–1829: A Bibliographical Survey of Prose Fiction Published in Britain and Ireland (OUP, 2000). Cardiff Corvey, founded by Garside and Anthony Mandal, then a doctoral student at Cardiff, published its first issue in August 1997, and featured an article that highlighted key statistical findings about fiction between 1800 and 1829 that drew on the bibliographical work underpinning The English Novel. This internationalist perspective began to draw attention from international scholars who proposed submissions relating to their own research, thus transforming Cardiff Corvey into a peer-reviewed journal, which despite its focus on bibliographical and editorial work had a global reach, and issued articles as well as reports. By 2005, it was clear that the title Cardiff Corvey inadequately captured our broader remit, thus leading us to rebrand the journal under the present title, Romantic Textualities: Literature and Print Culture, 1780–1830, and adding regular reviews of books relating to Romantic print culture and textuality. Since its inception, the goal of Romantic Textualities has been to support the dissemination of research through open access (at a time when ‘open access’ was dismissed as little more than vanity publishing), by acting as a forum for the discussion and study of Romantic literature, textuality, bibliography, book history and print culture. Following the journal’s commitment to open access and interactivity, the current issue showcases a newly designed interface, search engine and tagging; items published from the current issues onwards will also be assigned a persistent DOI (Digital Object Identifier). We are also honoured to announce that Romantic Textualities is now published as one of the founding journals of the recently established Cardiff University Press. As part of its core values, Cardiff University Press follows a ‘diamond’ model of open access, publishing material at no cost to either its readers or its authors. We look forward to a fruitful relationship with the Press in the coming years. Another recent innovation is the integrated use of social media as part of the Romantic Textualities platform, through its Twitter feed @RomText and most significantly through its blog. Since its inception a few years ago, the blog has featured rolling content consisting of nearly seventy posts from a wide array of international contributors at various points in their academic careers. The blog has fostered much discussion about Romanticism, global literature and print culture dynamics, with topics including global Romanticism, Frankenstein and Fantasmagoriana, gothic bluebooks and chapbooks, and the silver-fork novel—to name a few—as well as an entire category dedicated exclusively to ‘Teaching Romanticism’, which has passed its twentieth post. Please visit our blog to find out more. Why stop at reading?—Feel free to contribute to the discussion and add your own thoughts on Romanticism, either through the comments feature or by proposing your own posts. Much is already in motion for the next issue, scheduled for publication early next year, and we have some exciting announcements to make shortly regarding new developments in the journal. As always, we welcome submissions: please visit our see our Instructions for Authors for more information. 2. See <http://cardiffuniversitypress.org> for more details.